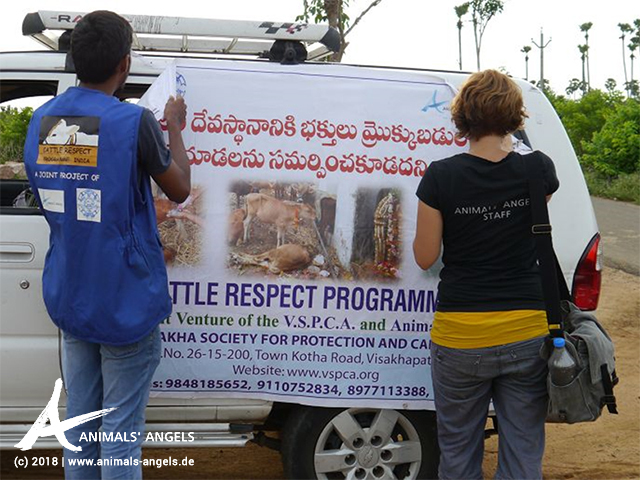 20-06-2018 Animal Markets India Created by Animals' Angels e. V.
With our ‚Protect-the-Calves-Truck‘, Animals‘ Angels and partner VSPCA visit several villages in the region of Denkada. Our education campaign aims at bringing an end to the tradition of donating calves to the temple of Simhachalam. Today, we visit five villages. We post bills, distribute leaflets and talk to the villagers about the suffering that awaits their calves at the temple. The villagers are very friendly, eagerly interested and ask many questions. They often express their concern to be offending the gods when bringing no more calves to the temple. But our campaign is closely coordinated with the temple, and thus we know that alternative gifts like coconuts and small monetary donations are even more welcome than ‘mixed-raced’ calves who are considered ‚unholy’. We will continue our campaign over the next months. We already achieved first successes: The number of calves being donated to the temple has already decreased.